Peter Havlik talks with Susan Schadler, former IMF Deputy Director, about Ukraine’s deeply rooted governance problems and the weaknesses of the IMF engagement in the country. On the occasion of Susan Schadler’s lecture ‘The Economic Quagmire in Ukraine’, held at wiiw on 10 December, former wiiw Deputy Director Peter Havlik interviewed Ms. Schadler about her assessment of the IMF’s engagement in Ukraine and the country’s future prospects. Susan M. Schadler is Senior Fellow at the Centre for International Governance Innovation (CIGI) in Waterloo, Canada. 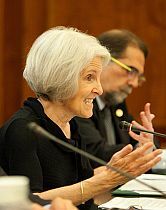 Until 2007, she led the IMF’s teams working with governments in Central and Eastern Europe, Turkey, the UK and Germany.